"I think its time to put aside the snippets gleaned by John and Mike from that purveyor of half truths bastion of liberty that is the Hunts Post and let you know what I’ve really been up to. "In 1978, which seems a long time ago now, I went to Oxford to read law where I remained in close touch with Robert McWilliams and Caroline Gooding, as she then was. Some of you may recall that I was keen on politics in those days. I’m pleased to say that I was cured of that ailment, learning the truth of the adage that in politics your opponents are opposite you, but your enemies are behind you. I’m sure that Julian Walden will assure us that it’s all different now….but I may take some convincing. "I went to London in 1981 and was called to the Bar (no change there some might say…) in 1982. After a brief spell in the Temple I joined a set of chambers in Cambridge in 1983, which was probably one of my best decisions ever. From time to time I bump into “Nick” Nicolson in the city, still as good conversation as ever. "Over the course of the next twenty years I had a mixed practice across East Anglia, bought a house in a village outside Cambridge, got married and had two children, Alexandra, now 23 and a teaching assistant, and George, now 19 and reading politics at Manchester. "In 2002 I became divorced and ended up in St Ives, about 12 miles from Cambridge. I rather threw myself into local life, becoming involved in the campaign to save the Corn Exchange, a fine town centre building which the Town Council wanted to sell to developers. This led, amongst other things, to proceedings in the High Court to restrain them from making the sale. In the end a deal was done, but public dissatisfaction with the council was such that I joined a tranche of independent candidates to stand in the following election. We were all elected and we increased our hold on the council in last year’s elections. "By 2010 I was also chairman of the company running the Corn Exchange, Deputy Mayor and vice chairman of the Parochial Church Council (during an interregnum between incumbents). 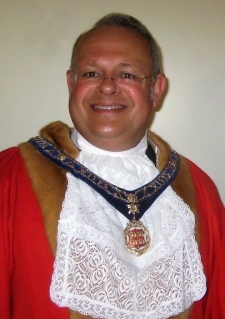 The following year I became Mayor, with my daughter Alex as Mayoress, and endured ordeal by vol au vent; I was warned that being Mayor was worth about a stone and a half, and so it proved. "Meanwhile, I had become head of chambers and somehow had to earn a living in my spare time. "No longer Mayor, I can draw breath a bit. Very good to hear news from so many of you, and thank you to Mike and John in particular for all the effort you put into this." “We have got to be alive to how we can respond to savings,” he said. “We have taken over the public toilets at the bus station. We have got to anticipate how Huntingdonshire District Council and Cambridgeshire County Council will make savings, and see how we can help plug those gaps." On a more serious note (G major), Martin's involvement in the "Corn Exchange controversy" led to the building being saved for the town and for posterity. After four years of campaigning, planning, fundraising and hard work, the members of the St Ives Town Council and the ACE (the local action group formed to save the publicly owned Corn Exchange) ensured this historic building was not sold off. Instead it was refurbished and saved for the local community. 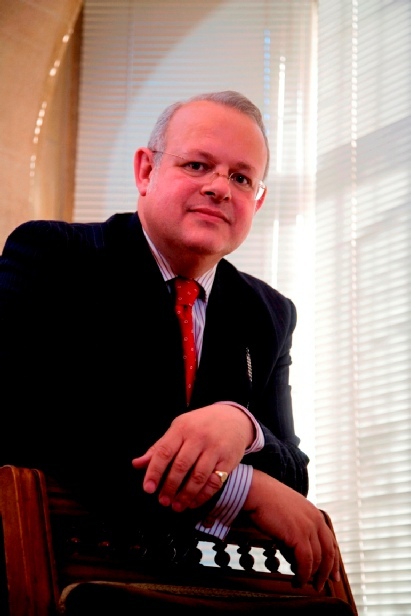 Outside his time on the Council, Martin is based at Fenners Chambers in Cambridge. 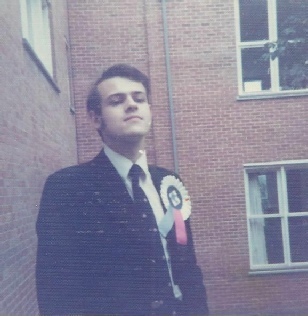 We have also posted a page about Martin's 1977 election success as Chairman of the Staff-Student Consultative Council.